What Interest Rate Can You Really Get For Your Mortgage? When you set out to buy a home, one of the first things you look at is where mortgage interest rates are these days. The second thing you want to know is can you get that rate? 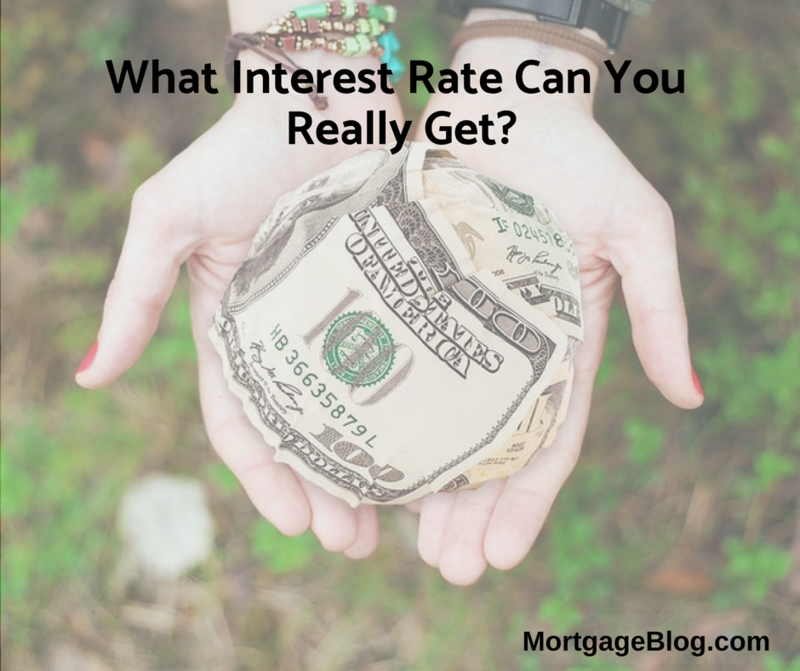 If the answer is no and you can only get a higher interest rate, you’ll want to know what gives? Understanding how they determine the interest rate you qualify for, versus what you see in a general online search, is critical. It boils down to the risk you represent to the lender, based on specific factors that cause them to raise interest rates to offset the risk. Some factors are out of your control, but if you make the most of those you can influence, you’ll save money on your mortgage – every single month. The savings can be a quarter of a percent, or higher, which may seem small but the potential savings add up. For example, on a $600,000 loan with a 30 year fixed rate mortgage, the difference in the payment at 4.5% versus 4.75% is approximately $90/month. Over five years that adds up to an extra $5400 — enough to make an effort worth your time. This post will give you an overview of the most significant factors impacting the rate you can really get. The higher your credit score – the lower risk you present to a lender and lower the interest rate you can expect on a mortgage. Your credit score is the historic scorecard telling a lender how reliable you’ll be in paying back your mortgage as agreed. Getting it as high as possible isn’t something that happens quickly, so check your credit report early on in your process and learn more details in this recent post. Beyond that, explore with a lender which credit score earns a better rate. For instance, a credit score above 780 will receive the best interest rate possible, while a score between 740 to 779 equals a higher rate, and a score between 700 to 739 – even higher. The amount of equity is another critical risk factor impacting your interest rate. Equity is the portion of the property value that you have contributed, versus the portion that you borrow. The standard breakeven percentage when purchasing a home is 20% equity. If you put less than 20% of your own money into a property, lenders see an increased risk that you’ll stop paying your mortgage is something goes wrong, based on historical trends. The potential impact on your interest rate doesn’t stop at 20%, as the more equity you have in the property, the lower the interest rate. At 25%, 30% and even 50% equity, the interest rate can drop significantly. However, the decision to use all your cash to increase your equity should not be based solely on the interest rate you can obtain. Take the time to consult professionals to help you analyze using your savings for an increased downpayment versus using it for investments that may provide a better return. Your mortgage amount affects the interest rate, based on the three loan size categories: conforming, high balance conforming and Jumbo loans. The first two categories refer to mortgage amounts the two Government Sponsored Enterprises (GSE’s) will purchase from lenders after they have closed the loan. The GSE’s, Fannie Mae and Freddie Mac, review and adjust loan limits annually, and baseline rates for conforming and high balance loans constantly change with the economic markets. Loans above $679,650 are called Jumbo loans and carry stricter guidelines. Your credit score and the amount of your equity make a more significant impact on Jumbo loan interest rates than a conforming loan. Lenders’ evaluate the risk based on the potential loss of the money they’re giving you (more than $680,000) which is higher than the loss of a smaller conforming loan. You’re intended use of a property after you buy it creates a certain level of potential risk to lenders. If you’re buying a property for your home, the interest rate will be lower than if you’re buying a vacation home. The highest interest rate goes to a rental property because of the more significant risk of foreclosure, and this is one factor you can’t control. On an investment property, lenders assume there’s a higher risk of foreclosure because there’s less of an emotional commitment to continue to pay the mortgage if you face a financial crisis. So, minimum equity requirements of 40+% are common for an investment property loan to lessen the risk. But that amount of equity won’t lower the interest rate. In general, interest rates are lower for buying a home, a bit higher for a simple refinance to lower the rate while refinancing to take cash out of equity carries a much higher rate. In fact, the risk isn’t a factor in the difference between a purchase loan rate and a simple refinance rate. It’s more about marketing, as lenders use the purchase loan opportunity to gain new customers by lowering interest rates. On the other hand, lenders see significant risk in cash-out refinance loans, and they carry stricter guidelines to go with their higher interest rates. Lenders will require details and documents related to the need for the cash-out and impose higher equity requirements for these types of loans. You also have the option to pay a fee upfront (known as ‘paying points’) to get a lower interest rate. One point is equal to one percent of your loan amount, so a $600,000 loan would require $6,000 (one point) to get a reduction in the rate of ⅛ to ¼%, which equals $45 to $90/month. To ‘break-even on that upfront $6000, it will take 5 ½ to 11 years, and any benefit from the lower rate would begin after that time. The weight lenders give to each of these risk factors varies from time to time depending on the economic environment. But by becoming aware of their potential impact, you gain to change what you can in the time you need so you can optimize your interest rate.